In the world of email marketing, newsletters hold the top-most spot. They are an excellent way to connect with your subscribers and create an ongoing relationship with them. Creating an interesting and valuable campaign is the starting point. You need to be sure that the right content is offered to the audience and there are CTA (call to action) buttons that are correctly linked. There are a hundred other things to take into account - broken links, typos, images not rendering correctly, incorrect or poor personalisation, sending the email to the right group etc. And even as a seasoned marketer, you may feel some amount of anxiety when you are about to hit the 'Send' button. And that is where this handy checklist plays an important role. This checklist will ensure that your email format is ideal and any errors are corrected. You can use this email infographic to dissect your emails and send them with confidence instead of fear. It’s but natural to feel some level of anxiety before sending out an important email campaign, especially if that email will be reaching hundreds of thousands of your subscribers. If you use the tips listed in the infographic above, you’ll be able to reduce your fears and feel confident each time you hit send. So, what are you waiting for? 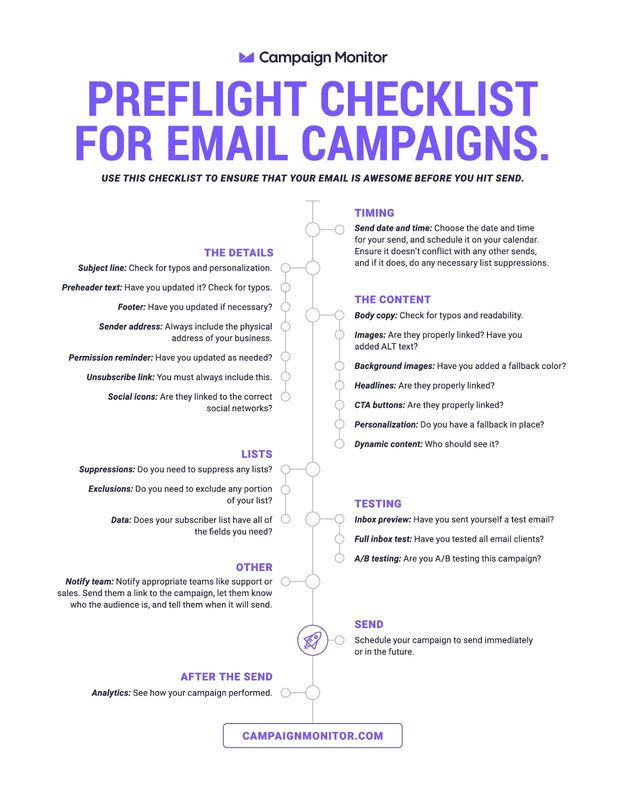 Save, print, and use this checklist for your next email campaign. And if you want more such useful resources, go and check out Campaign Monitor.